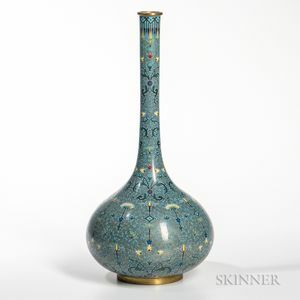 Cloisonne Crane-neck Vase, China, possibly Jiaqing period, decorated with floral sprays and palmette scrolls below a broad band of ruyi motifs and tassels around mouth, against a turquoise ground with swirled roundels, ht. 15 1/2 in. two dents to a side with cracking enamels, surface scratches.